﻿Get the Core Game Set to go along with it! Play solo or play multiplayer. 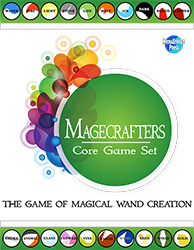 There are hundreds of game pieces and 30 wands to create, plus some blanks to create your own, just like in the books! Can't get enough Magecrafters? Read the books, too! Milton is a wizard of a special sort: a Magecrafter. He's a wizard that creates magical items, specifically magical wands. 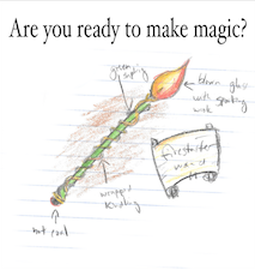 Join him and his apprentice Duncan as they create magical items. Learn the rules of magic-making and see Milton's rival, Meerfus in action! This young reader series is great for elementary school and up. TRY A SAMPLE OF THE GAME FOR FREE! 30 Unique Wands to Create! Plus you can make your own! ﻿Hundreds of Materials to build wands with in the game! Plus get special rules materials! Challenge a friend or play alone! This set contains multiple gameplay versions for more excitement! GET THE FULL GAME NOW!